Guys, there is a new shaving subscription club in town and I’ve tried it for you! I shaved my beard (I used the razor and the shaving products included) every day for 7 days to give you an honest opinion of The Huntsman Club. The Huntsman Club is a shaving subscription club that promises to deliver to you everything you need for a luxurious shave. Every 6 or 12 weeks (depending on how often you shave), you will receive a box with an exclusive Huntsman razor, Gillette Mach III Blades, Hydrating Pre-Shave Lotion, and Shaving Cream (both from Edwin Jagger). If you have read my reviews before, you know that I value a lot the packaging of any subscription service. I am very impressed with the design of the box. Everything is well presented, and it definitely shows the luxurious side that The Huntsman Club is proud of. Shaving guide (very well designed). When you subscribe to a shaving club, the most difficult part is to get a good razor. I have reviewed Cornerstone and I thought their razor was way too light. So what about the Huntsman Club razor? I wouldn’t say this is the best one I’ve used but it is definitely in my Top 3. It has a perfect weight, a good grip and it feels really good in my hand. I used it every single day for a week when I shaved my beard and I have no complains at all. I still use it to shave my neck line and it is doing a fantastic job. This is a very good razor and it looks like a very expansive one too! The Huntsman Club razor is compatible with Gillette Mach 3 blades. If you like the brand, I am sure you are in familiar territory here and will appreciate the quality of shave. I am not a big fan of Gillette but the Mach 3 worked well on my skin and I didn’t experience any cuts or irritation. 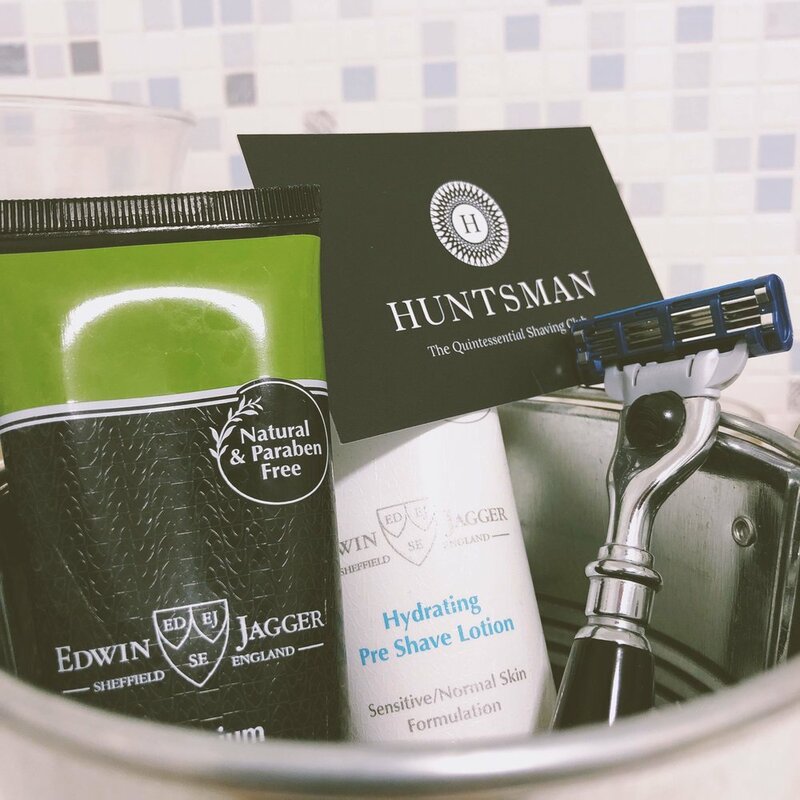 The Huntsman Club wants you to experience the best shaving experience so they have included a Pre shave lotion and shaving cream from Edwin Jagger. The only thing I can say is: outstanding choice! These two products are the stars of this box. I immediately became a fan. I really think that with this Pre Shave Lotion and Shaving Cream you will improve your daily shaving ritual. When you subscribe, you can choose the products you want according to your skin type but all of them are from Edwin Jagger so you don’t have to worry! Shaving subscription clubs are a crowded market right now, and it can be difficult to choose the right one. The Huntsman Club has positioned itself as a luxurious shaving experience box, and I think they have reached their goal. I am very pleased with the experience: from the packaging, to the choice of products included in the box. Thanks for reading and if you want to discover exclusive skincare products, follow me on Instagram! Disclaimer: The Huntsman Club sent me a box for free for review purposes, however this post reflect my honest opinion about it.